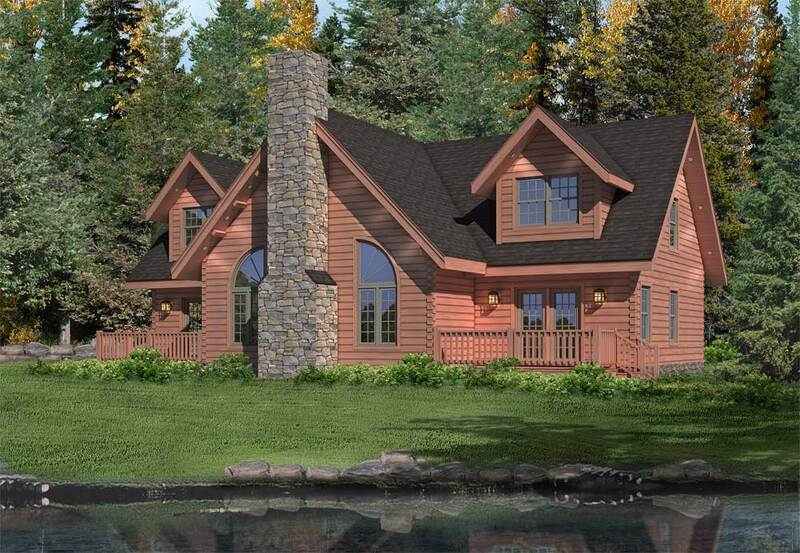 The Brookside II log home design offers 2,467 square feet of total living space. 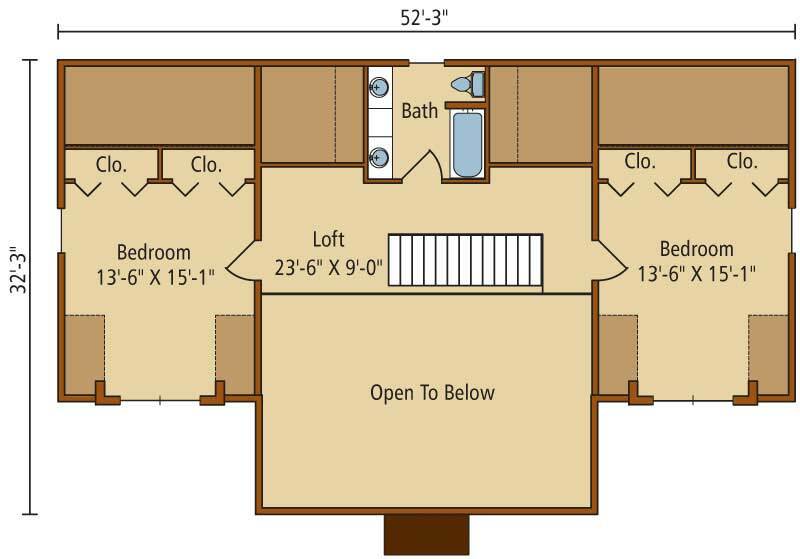 The floor plan features 3 bedrooms and 2.5 baths. The log home plan is a timeless, practical design that provides two symmetrical wings and a center section that extends forward creating an elegant log home design. 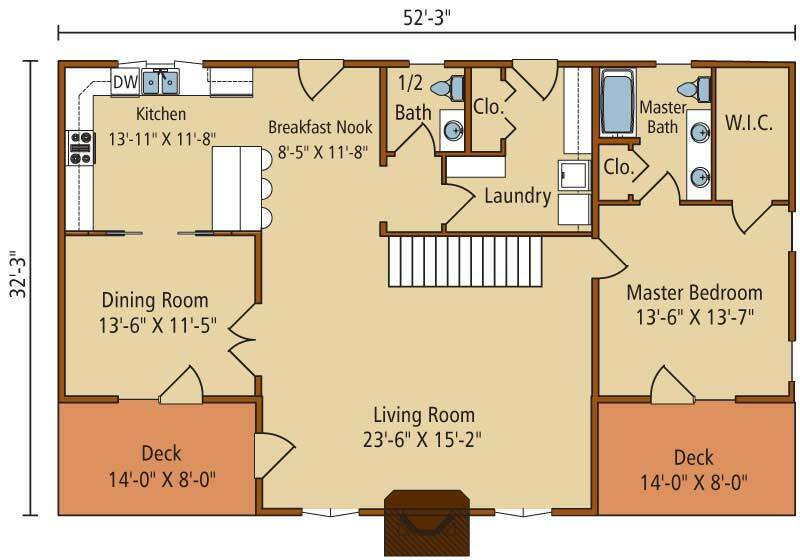 The Brookside II log home design offers 2,467 square feet of total living space. The floor plan features 3 bedrooms and 2.5 baths. The log home plan is a timeless, practical design that provides two symmetrical wings and a center section that extends forward creating an elegant log home design. Inside the living room is more like a great room with its grand features – a vaulted ceiling, soaring stone fireplace flanked by rectangular and quarter round windows. The U-shaped kitchen design features an eat-in area along with a separate breakfast nook. The spacious master bedroom suite, with large walk-in closet, occupies the right wing of the home. An additional perk is the suite’s access to a private deck area. On the second level, the panoramic loft leads to a spacious bedroom on the left and one on the right. A second full bath is also incorporated into the second level design. 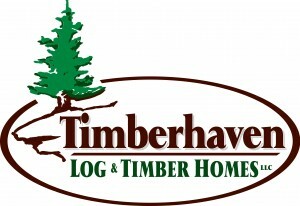 Timberhaven Log & Timber Homes offers hundreds of pre-drawn log home designs. You can make modifications to any of these log home floor plan, including the Brookside II log home plan, or you can use these plans to spark your own custom log home design. Rustic elegance can be yours with the Brookside II log home package by Timberhaven Log Homes & Timber Frame Homes. Contact us today to learn more about our log home floor plans or to request pricing for this popular Brookside II log home model.